It looks like the Amazon Echo Show is about to get a direct competitor from Google. 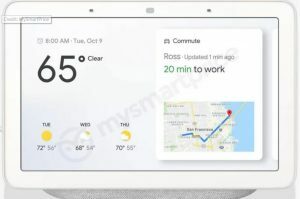 According to MySmartPrice, this is the new Google Home Hub, a 7-inch display and speaker unit powered by Google Assistant. The new device will likely be introduced alongside the Pixel 3 and Pixel 3XL at the Google special event on October 9.